In Newscoop, renditions are crop sizes for still images. The same image can be used at various crop sizes, in different parts of your publication's theme, without having to be resized manually. See the chapter The sidebar for more details of using image renditions. The Newscoop system's name for a particular rendition, and its crop size, depends on the publication's theme. However, the name that your publication staff use for that size of image may be different. 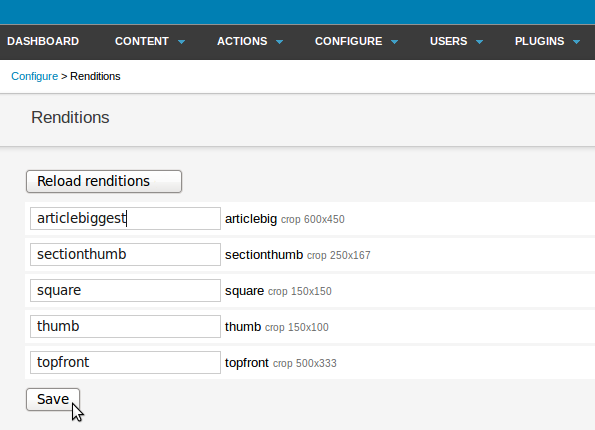 On the Configure menu, click Image Rendering to open a page with the names of the currently configured image renditions. In this page you can change the display name of one or more renditions. Then click the Save button. The new display name for the rendition will be shown the next time your publication staff edit an article. You should click the Reload renditions button after switching to a new theme with different rendition names or sizes.